In 2000, director Kinji Fukasaku unleashed Battle Royale, his violently poetic epic about an innocent group of Junior High students forced by the government to hunt and kill their classmates for sport. It was nominated for 10 Japanese Academy Awards, launched a global phenomenon, and banned from screens by frightened civic groups and distributors across America. Three years later, the equally disturbing sequel - featuring a new class, new rules, and a brutal terrorist plot by the film's first young survivors - triggered its own tragic firestorm around the world. 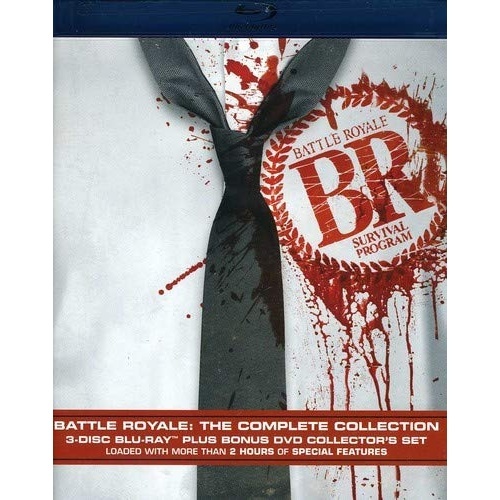 Now for the first time ever, you can see it all: Experience the entire Battle Royale on 4 discs - including more than 2 hours of definitive Special Features - that forever blasts open one of the most potent, shocking and savagely influential sagas in motion history. Includes: Disc 1 - Battle Royale director's cut with both Japanese and English language tracks & subtitles. Disc 2 - Battle Royal theatrical cut with both Japanese and English language tracks & subtitles. Disc 3 - Battle Royale II with both Japanese and English language tracks & subtitles. Disc 4 - Battle Royale bonus content (194 mins) with Japanese language and English subtitles.